Maximum Altitude – 5361 m/ 17590 ft.
Day 2: Phakding to Namche bazaar. You will be having trek form Phakding to Namche bazaar. Day 3: Spending a day at Namche bazaar for acclimatisation & exploring the place. 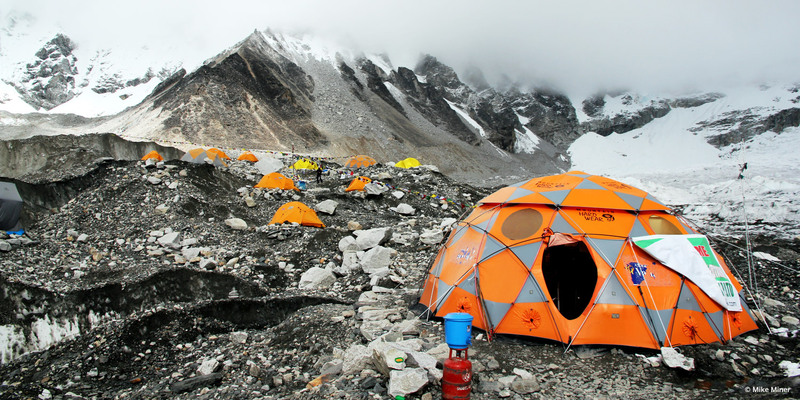 While there are various things to ponder over when you consider other treks, Everest Base Camp doesn’t really need one. It’s possibly the easiest access that there is to get a glimpse of the highest point on earth, Mt Everest (8850m). The trek is not only scenic, but also challenging, as it gives you the perfect sense of adventure, right from the moment you land in Lukla. For years, this has been a path trodden by mountaineering greats and at the end of it, you can say you were one of the fortunate ones to follow in their footsteps. If the flight wasn’t breath-taking enough, landing at the Tenzing Hillary Airport at Lukla surely will be considering its short runway nestled amid the mountains. A good place to buy some last minute essentials, especially prayer flags that you can put up at Everest Base Camp, we start out the same day as a three to four our walk will bring us to Phakding. We wake up to the sound of the Dudh Kosi and get ready to tackle the first real challenge. The walk up to Namche Bazaar is steep where we cross a number of suspension bridges. There’s a lot of curios on the way that are sold by locals, but remember that you have to carry it all! Once you enter the Beyul Khumbu Park, it’s a short work to Namche Bazaar. Spending a day at Namche bazaar. Explore the place and get acquainted to the environment. You have plenty of time to move and discover the surrounding of new place. Sleeping inside blanket wouldn’t help you so move out and have a lovely time. Starting off past the terraced fields once we leave Namche Bazaar, we get closer to the snow-covered mountains on this day. The track is well-maintained and soon, we will walk through a rhododendron forest. The finally two hours is again a steep climb that leads to the Tengboche monastery, right adjacent to the village. The walk today is one of the easiest of the trek as we first make our way down to a forest, until we start climbing towards Dingboche. The vegetation makes way for shrub in patches, and soon, the spectacular Ama Dablam peak pops up. The sight is enough to keep you occupied and before you know, we would have reached Dingboche. The day starts off with a steep climb for a short distance, before you are on flat ground again. The landscape around you will be white, making it seem like a walk through fairyland. But en route are also small stone memorials dedicated to those who had died in this region – a stark reminder of how important it is to be safe in the mountains. Here on, it’s a simple walk to Lobuche. There’s enough reason to ignore any pain today, for just a day’s walk will bring you to Everest Base Camp. The only challenge en route is jumping across the many rocks and stones that dot the wide valley. You will be surprised to see tiny flowers growing here, despite the harsh conditions. A slow and steady march will bring you to Gorakshep, and a little ahead, the Everest Base Camp, which is marked by the many prayer flags put up there. Rising early has its perks and though the climb to Kalapathar will test your abilities due to the high altitude, you will certainly be rewarded as the sun comes up right behind Everest. And we can assure you there are few sights as beautiful as the highest point on earth! The 7 days of experience has lot to be explained. Just as to reach gorakshep your return journey from the EBC starts. The journey full of experiences & a feel of Mount Everest brings goosebumps. Going back from this crazy adventure ride brings sadness not wonder its brings more pleasure when you think of your next step to adventure. This adventure brings closer to Mount Everest. Adventure never ends. This is just a beginning! Experience the challenge of Mount Everest Base Camp trekking with himalaya destination at minimum package. The adventure journey of Everest trek is ineffable. Be a part of this amazing expedition feel for yourself. One of the most demanding popular tour amongst trekkers.